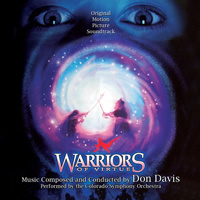 BUYSOUNDTRAX Records will be releasing the soundtrack for WARRIORS OF VIRTUE, featuring music composed by Don Davis (BOUND, The MATRIX trilogy, HOUSE ON HAUNTED HILL, JURASSIC PARK III) for the 1997 fantasy film directed by Ronny Yu (THE BRIDE WITH WHITE HAIR), written by Michael Vickerman, Hugh Kelley and the Law brothers, starring Mario Yedidia, Marley Shelton, Chao Li Chi, Dale Wilson, Kathleen Barr, Doug Parker, Scott McNeil, Doug Jones, Lee Arenberg, Dennis Dun and Angus MacFadyen as Komodo. WARRIORS OF VIRTUE tells the story of Ryan Jeffers (Yedidia), a disabled middle school student who spends most of his time reading comic books and imagining other worlds where he might have great adventures. One day, he stops at his favorite Chinese restaurant and visits with Ming (Dun), the owner. Ming gives Ryan a manuscript of Tao, which is a representation of the five elements that make up the Tao mythology. Ming suggests that Ryan should read the manuscript and it might lead to his ‘true enlightenment’. During school, Ryan is the waterboy for the football team. One afternoon, Ryan is caught staring at the quarterback’s girlfriend and the team starts picking on Ryan and his friend, Chucky. After the girl stands up for Ryan, the quarterback invites Ryan and Chucky to a water treatment plant for an initiation ritual that involves them going across a flimsy pipe to graffiti their names on a wall. Ignoring Chucky’s warnings and feeling ashamed about his disability, Ryan tries to go across the pipe but is blasted into a water tank. Awakening in the land of Tao, Ryan discovers his disability is gone and he has the use of his legs. Shortly thereafter, he is attacked by soldiers and in the process of escaping, he loses his backpack, which contains the Tao manuscript. Ryan encounters the dwarf-like Mudlap who brings him to Elysia (Shelton), a beautiful girl in white robes. Elysia takes him to Master Chung (Chi). Master Chung leads the Warriors Of Virtue, five anthropomorphic kangaroos who wield the power of the elements. The Warriors are in search of the Manuscript of Legend. They are opposed by the evil warlord Komodo (MacFadyen), who leads an army that has been terrorizing the Land of Tao while Komodo is on a quest to destroy all the lifesprings, the sources of balance and harmony in Tao. Ryan learns that Ming’s gift is in actuality the Manuscript Of Legend and the secrets contained within its pages will decide the outcome in the battle between the forces of good and evil. With the Manuscript now in Komodo’s hands, Ryan must unite the Warriors Of Virtue and recover the Manuscript so that he can decipher its secrets and save Tao. Released in 1997, WARRIORS OF VIRTUE is a fantasy film filled with lofty ambitions that failed to find its audience. The film is the product of four wealthy brothers, transplanted from Hong Kong to settle in Colorado, the Law brothers. Surgeons by trade but with a creative and financial interest in cinema, they decided to make a Hollywood blockbuster. The brothers invested $35 million of their combined fortunes into developing and producing the film, a science fiction fantasy best described as a variation on THE WIZARD OF OZ meets KUNG-FU PANDA with a pouch-full of STAR WARS’ Force-full mysticism added for good measure. The brothers went on to personally finance another $20 million in marketing costs, with an eye on lucrative toy and other merchandise tie-ins. When the Law brothers were finished shooting the film, they were convinced their film deserved a fully orchestral, swashbuckling score to bring life to the world of Tao and assist its journey to acclaim and fortune. The brothers hoped to hire John Williams to score the film but his agent referred them to another composer by the name of Don Davis. He began work on scoring the film in 1995, two years prior to the film’s release. The producers told him they wanted a broad symphonic score, with a separate theme for each of the five Warriors and as one of the brothers was involved with the Colorado Opera Company, he wanted to commission a piece of concert music that involved these five themes, representing the virtues in the manner of an oratorio. This oratorio, called ‘Of The Illuminated’, received its premiere at the Breckenridge Music Festival in the summer of 1995. This unique (and lengthy) affiliation with the project allowed the composer to be a part of the creative team from the beginning of the project. The WARRIORS OF VIRTUE score was recorded with the Colorado Symphony Orchestra and mixed by Armin Steiner. Emmy winning composer Don Davis began playing trumpet and piano at the age of nine, and started writing music at twelve. As his affinity for music grew, so did his aspirations, and soon he was composing and arranging orchestral charts for local jazz ensembles that he also performed with. After graduation from high school, Davis furthered his study of music at UCLA, majoring in music theory and composition, playing trumpet in college jazz ensembles and orchestras. After graduation from UCLA, Davis continued to study composition with Henri Lazarof and orchestration under Albert Harris. Harris introduced the young Davis to film and television composer Joe Harnell, best known for his work on TV shows such as V and THE INCREDIBLE HULK. He was immediately impressed by Davis' attention to orchestral detail, especially as evidenced by a chamber symphony Davis was writing at the time. Harnell became a mentor to Davis and introduced him to the professional world of film and television scoring. His early compositional work caught the attention of composer Lee Holdridge, who had penned the theme music for the television series BEAUTY AND THE BEAST and he helped Davis land the job composing weekly scores for the show. Davis' rich orchestral style meshed perfectly with the tone of the show and he went on to win an Emmy for his work and achieve great acclaim as one of television's most gifted young composers. After BEAUTY AND THE BEAST, Davis found his career as a composer soaring and he was commissioned to compose scores for dozens of top television movies and series, including SEAQUEST DSV, HOUSE OF FRANKENSTEIN, Peter Benchley’s THE BEAST, TINY TOON ADVENTURES and STAR TREK: THE NEXT GENERATION. In 1997, Davis composed the score for Larry and Andy Wachowski's off-beat thriller BOUND, and the directing brothers immediately formed a close working relationship with Davis. The Wachowskis and Davis again collaborated on the MATRIX Trilogy. Davis' work for the three scores incorporated elements of popular music, electronic synthesizer effects, and even a touch of the avant-garde. His full length three act opera "Río de Sangre" premiered in October, 2010 at the Florentine Opera Company in Milwaukee, Wisconsin. The full production included 10 principals with a 40 voice choir and an 11-piece stage ensemble, accompanied by the Milwaukee Symphony Orchestra conducted by Joseph Rescigno. WARRIORS OF VIRTUE was first released on compact disc by Kid Rhino with a short presentation of the score and nine songs at the time of the film’s release and later released again in a better presentation by Prometheus Records minus the songs and with more of Don Davis’ score restored. Buysoundtrax Records now presents a new release of WARRIORS OF VIRTUE, with liner notes written by author Randall Larson including new comments from the composer, along with new mastering from Digital Outland, allowing a new audience to discover Don Davis’ wonderful score.